D-614, Red Color, Hindu Cards. 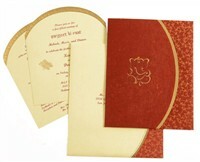 The front of this beautifully designed card has self-embossed and golden border design and the embossed image of Ganesh ji with golden outlines and deep red detailing. A kundan tilak accentuates the beauty of the image. 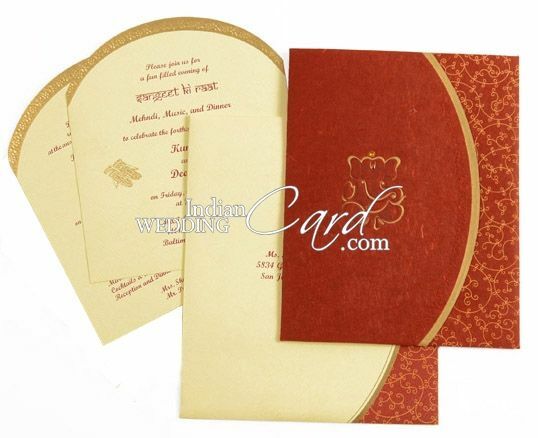 The other fold has a floral base design in ochre and the interleaf follows a similar design. 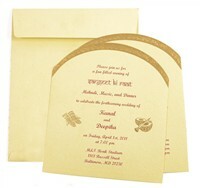 The inserts have embossed floral motif borders in gold and the envelope has golden borders and floral base in ochre over red ground.